Keep patrons and staff safe with the most trusted name in mass notification. Regroup gives stadiums and larger venues the tools they need for critical and non-critical communications. 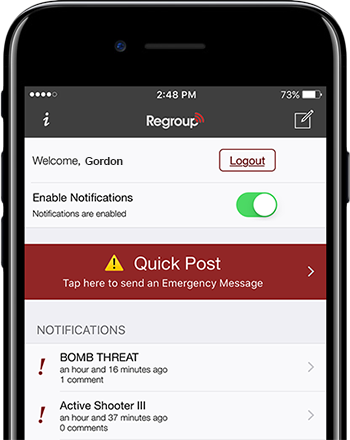 Regroup enables you to rapidly send multi-channel, multi-language critical alerts and operational communications with a single click or tap. It gives security teams the ability to collaborate confidential information and report suspicious activity quickly and easily. This allows rapid mobilization and coordination with law enforcement in the event of a critical situation. Trusting an industry leader in mass notification provides peace of mind and proven reliability between all media and devices. Regroup ensures that recipients receive all of your important messages and streamlines operations at your facility to reduce costs and improve efficiency. Download our guide to Regroup for Stadiums and Larger Venues today and see how Regroup Mass Notification can help you keep mobile workforces on point and safe while reducing the overall costs associated with your communication plan.